The Ma and Pa Kettle DVD Box Set is the complete collection over 10 discs available for the first time. Ma and Pa Kettle have their hands full with a ramshackle farm and a brood of ramshackle children. When the future comes a-callin' in the form of modern houses, exotic locales and newfangled ideas, Ma and Pa must learn how to make the best of it with luck, pluck and a little country charm. I used to wait for the sundsy matenee to be on loved Elvis movies and gadget also Hr buffin stuff and Flicka but to get a good clean laughter you just got to see the ma and pa collection. I am I know id look at it like gold because all the memories I have and they were great times. 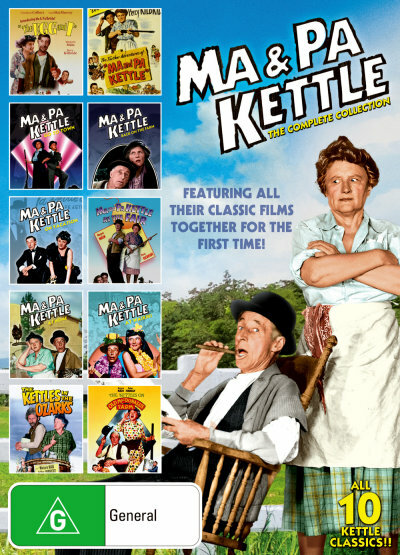 Click the button below to add the MA AND PA KETTLE - COMPLETE COLLECTION to your wish list.